The Academy has state of the art facilities like a Cisco Tele-presence room, 2 video-conference rooms, a seminar room, workstations, well-equipped laboratories, an Atrium, and a leisure area. 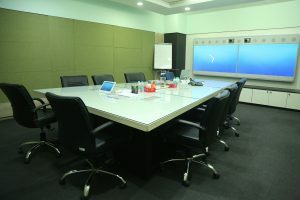 The room is equipped with world-class Tele-presence facility provided by Cisco Systems. It is located on the ground floor of the Academy building. It can accommodate up to 12 delegates. 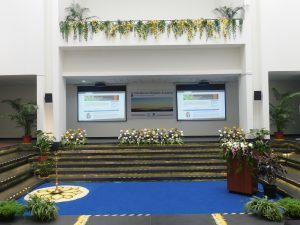 It is used for hosting important Academy meetings and the defense seminars of students. 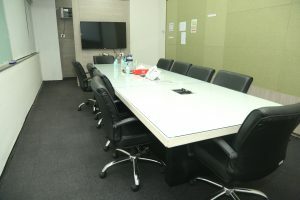 It also has a Teleconference facility which aids in connecting people from different locations for the meetings held here. The Academy has two Video-conference rooms, located on the ground floor and first floor. These rooms are provided to students and their supervisors for meetings. The video conference facilities installed by Cisco systems are excellent and create an ambiance of a face to face meeting between the users. 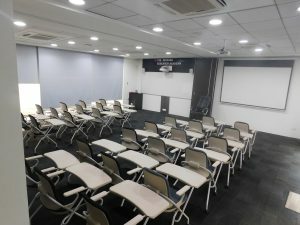 The rooms are equipped with whiteboards and projectors to aid the users to make presentations. This room can accommodate 40 delegates. It can be partitioned into two rooms, depending on the requirement. Each room is equipped with a whiteboard and projector. It is located on the Ground floor of the Academy. Its multipurpose usage for Academy Functions, Fresher Orientations, and as a Lecture Room makes good utility of space for learning. The visitors to the Academy are welcomed by the sight of a well-lit and spacious Atrium. It can be converted into an open theatre which can accommodate close to 120 delegates. It is equipped with dual short-throw projectors and speakers. The Atrium is the perfect place to host important functions of the Academy and those associated with it. The Academy currently houses laboratories related to Biology, Wet Chemical Synthesis, Materials Characterization, and Earth Sciences. A range of state of the art instruments and analytical equipments are available for use by approved staff, students and industry. Click here to read more. The Academy has a small leisure area on the ground floor where one can sit and relax. The area has a Table Tennis table where one can play and unwind after a stressful day. It also has a coffee machine from Café Coffee day where one can pick up their favorite espresso or café latte.